There are many ways to explore Seattle and enjoy the beautiful views, waterfront, parks and exciting atmosphere. 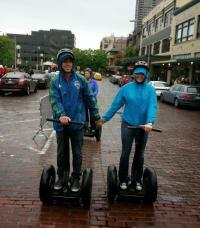 On a rainy afternoon, a group of four friends decided to explore Seattle on Segways. We booked our tour through Seattle By Segway ahead of time for a two-hour tour. Reservations are a must, as they often book up, especially in the summer months. The guides are very easy going and will cater the tour to what you are interested in learning or seeing. We met in the small headquarters on Alaskan Way under the viaduct for our introduction to riding. After a few awkward beginner practice rounds, it became almost second nature. Our guide, Ryan, was very helpful and had funny stories to share about other riders&apos; experiences. And then suddenly, we were off! We headed down the waterfront single file, enjoying views of ferry boats, the aquarium, Elliot Bay and laughing at passersby&apos;s delighted exclamations at our "Segway gang" as they referred to us. These tours run rain or shine which we soon found out as we felt the Seattle drizzle. Luckily, we came prepared with raincoats, so it was not a bother. 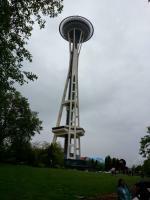 We rolled along through downtown Seattle to Seattle Center where I began to feel a little chill. I jokingly asked if there were any drive thru coffee shops along the way to which Ryan knowingly mentioned the McDonalds located next to the Space Needle. Well I decided to take him up on that suggestion and we headed to the drive thru to the shock and delight of the Micky D&apos;s workers and patrons. A few people took photos and asked us if that was our normal method of transportation. With my warm coffee in hand, we hit the streets - well, sidewalks - once again. Like a true Seattleite I can drive, even a Segway(! ), one handed with my coffee in the other hand. Our next stop was the oldest apartment building in the city where fisherman long ago would stay. There were not any stairs in the whole building so they could drag their equipment to their rooms. On the ride back to the main office the rain picked up and my hands started to get a little cold and my jeans were pretty wet but my spirits were high and my smile was still wide from the great ride. We all rode like champs, though remember these are motorized vehicles and can be dangerous as you ride across streets and you need to always pay attention because it is very easy to get distracted by all of the beautiful sights and interesting facts. This is a great way to experience the city from ground level and cover a lot of distance without tiring from walking. It made me want to own a Segway so I could ride it around all the time! Notes: Tours run daily, five times a day.